We, as submitters to God alone, believe that God created everything in this universe. This includes the languages we use today and the languages that are no more in use. It is true that God allows the humans to make progress and advances in whatever He gave them. This definitely includes the languages that different nations speak around the world. We also know that God chose the Arabic language for His Final Testament, the Quran. In His Final Testament, God placed the mathematical miracle of the Quran, based on number 19 and called it "One of the great miracles" 74:35. It would not then be a surprise to find out that God created the Arabic language alphabets, the language of the Quran , that will exhibit that 19 based mathematical miracle of the Quran of 19 different shapes. The Hamza being the 19th shape. 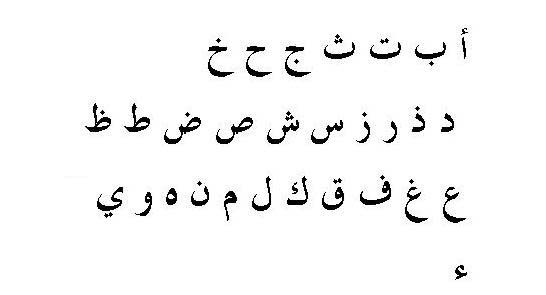 Mamoun Sakkal, a famous Calligraphy artist wrote in his article, "The Arabic alphabet contains 18 letter shapes, by adding one, two, or three dots to letters with similar phonetic characteristics a total of 28 letters are obtained." He did not count the Hamza because he considered it the same like an alif, but he is mistaken here. 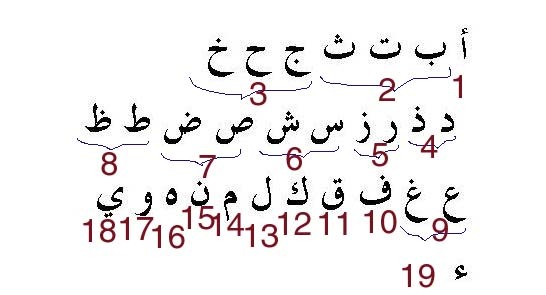 Although the hamza is considered an alif, and has the same gematrical value like an alif which is one, it has its unique shape, the 19th shape, and can be used in a word independent of the alif. The first writings of the Quran did not have the Hamzas. The hamzas were added later about the year 786 by Khalil Ibn Ahmad al-Farahidi, but they are a major part of the mathematical miracle of the Quran. The addition of the Hamza is the same like adding the numbers to the verses of the Quran, both were destined to be added in the future by future generations, but all their aspects were already calculated and counted by God Almighty, as a part of the miracle of the Quran discovered by the messenger of the covenant. [41:53] We will show them our proofs in the horizons, and within themselves, until they realize that this is the truth. * Is your Lord not sufficient as a witness of all things? *41:53 The words that compose this verse are 19, and their gematrical values add up to 1387, 19x73. This great prophecy, together with 9:33, 48:28, 61:9 & 110:2 inform us that the whole world is destined to accept the Quran as God's unaltered message (See Appendix 38).